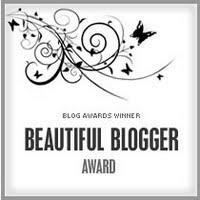 Months ago, Chaya (Chaya’s Comfy Cook–now only open to members) graciously gave me the Beautiful Blogger award. I was very touched with the award and by Chaya’s generous words. I love reading Chaya’s posts. She’s funny for one thing. I also love her post titles—always succinct and often humorous—and her very direct way of speaking to the reader. She cooks one of my very favorite foods—salmon—weekly (yes, weekly). 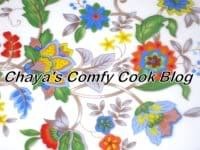 So, if you are looking for a gluten-free salmon recipe, be sure to look on Chaya’s Comfy Cook blog (again, available only via membership). Chaya bestowed the Beautiful Blogger award to six other folks (I was in great company!) and told more about herself. Thanks, Chaya! 1. My first job out of high school was at the FBI National Academy. Before you get too intrigued, my job was in the kitchen for the academy’s cafeteria, run by the Marriott Corporation. One of my aunts (my mom has seven sisters) was a manager and I got a job as a prep cook/alternate weekend cook. I was 17 years old and had absolutely no cooking experience. My mom didn’t really teach us to cook when we were growing up. Other than making occasional cakes and cupcakes from a box, she didn’t want us in the kitchen making messes. She was (and is) still a great mom and I eventually learned to cook when out on my own. But, there were often calls to mom for advice, and sometimes I still make those calls today. My aunt did teach me a lot in the giant commercial kitchen (stainless steel, tile, huge walk-in refrigerators and freezers, etc.) and I managed to hold my own. For almost everything I made there was a recipe and the ingredients I used were real ones, even though most were canned or frozen versus fresh. My favorite job was probably making spaghetti sauce in a huge vat. Well, for all my prep work, I pretty much made everything in a huge vat or an equally huge wheeled tub. I cracked eggs—in preparation for scrambled eggs—two at a time, one in each hand. Dozens of eggs, into one of those stainless steel wheeled tubs. Once one of the wheels caught on a crack in the tile as I was wheeling the tub into the walk-in refrigerator and it almost tipped over. I can still see that tub full of yellow teetering. My least favorite task on the job was cleaning the grill after cooking beef liver. Cooking bacon, sausage, eggs, and such for huge quantities of folks on a schedule wasn’t that great either. I had to be at work at something like 4:30 in the morning when I was the breakfast/lunch cook on weekends. I left feeling like a big grease bomb in my gold uniform with the requisite white, ultra dorky shoes. All in all though, it was a good experience and I learned a lot. 2. Mr. GFE and I met while working in a chain restaurant. I was a waitress; he was a waiter. He had just graduated from college in December and jobs were scarce. I was still in college and always kept a job as well. (Sometimes my jobs were part time, sometimes they were full time, and usually I was a waitress, because one could make the most money for the fewest hours.) The restaurant we both worked at had never had waiters before, but Mr. GFE convinced the manager that having another male on hand for the 1 am closing was a good idea. I can still visualize him as he looked back then. He was 22, but looked like a high school student and frankly, I found him more than a bit goofy. In short, I didn’t give him the time of day. He likes to say that I was the only waitress there who wouldn’t go out with him. Ha! He did have all the other waitresses doing a lot of his work (making salads, brewing coffee, etc. ), but to be fair, he was very nice to them and helped them, too; e.g., often carrying their heavy trays. Still … I was not interested, but he persisted. My two roommates also worked at the same restaurant. One was a hostess and the other was a waitress as well. Unbeknownst to me, Mr. GFE had quizzed them about my favorite things and he surprised me with a bag of goodies as we started our shift one evening. He told me that he’d left something for me by my coat. I pretty much ignored him and the gift until he persisted and I saw the red carnation sticking out of the brown paper bag. I relented momentarily to see what else he had brought me. There was a bag of pistachios … and a box of Nestle Quik (okay, I am embarrassed to say that I was a serious chocolate milk nut then). His simple, sincere gifts got a smile out of me. Still, when he asked me to go out dancing the following weekend, I said, “maybe.” Of course, I did eventually say “yes” … we went dancing and had a fantastic time. 3. The first meal I ever prepared for Mr. GFE was one that makes some folks turn away in horror. Chicken livers. One evening as I was leaving the restaurant where we both worked, I said I was going home to make dinner. He asked what I was having. I told him chicken livers, expecting a horrified reaction. His response was, “I love chicken livers.” So I invited him to stop by after work. As that would be after 1 am, he just expected us to stand in the kitchen and chow down. However, I served the fried chicken livers, plus mixed vegetables in butter sauce over rice at our antique dining room table. On my grandmother’s china. With her good silver. By candlelight. Okay, I admit it … by then, I’d decided I really liked him. It was a good start to many meals together. We still love fried chicken livers. Then, and sometimes, still, I just feel like I need them, not just that I like the taste. (Iron deficiency, perhaps? I did suffer from anemia when pregnant; it’s related to gluten issues. See listing (pdf).) These days, of course, the chicken livers we eat are gluten free and fried in just a little bit of healthy oil, like grapeseed or olive oil. And, they are more likely to be served with quinoa or just veggies as a side. 4. My love of chicken livers also made for another interesting story. 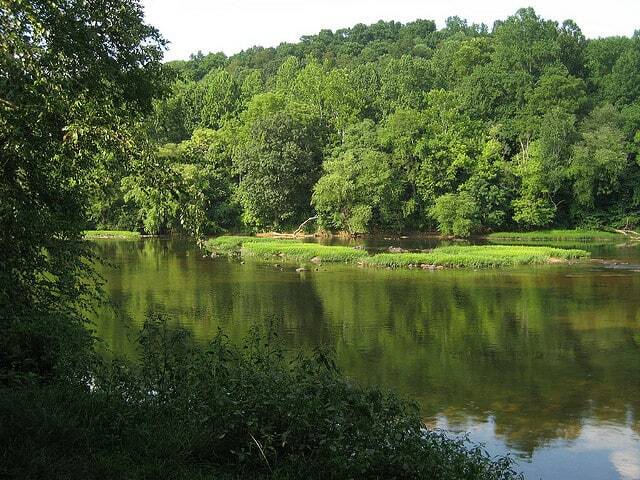 Mr. GFE and a group of us had gone tubing down the river near the house he rented at the time. The house was called the Little Castle because it was a multi-level, stone house, with a flat roof and turrets, built into the side of the hill. The flat roof was great for viewing fireworks over the same river. There was a Big Castle, too—the main house, which was also stone, square, and with turrets. The Little Castle had been a garage with maid’s quarters above, that had later been converted into a complete—albeit small—house, with kitchen and living room. (We ended up living there after we were married.) There was also a bomb shelter and a graveyard on the property. The current owners of both castles are friends of ours. They host an annual Halloween party between the graveyard and the bomb shelter, which we attend every year. It’s a terrific party. But, I digress. So we had gone tubing down on the Rappahannock River. We’d put in at a calm, peaceful area, but then proceeded to the Class III rapids. 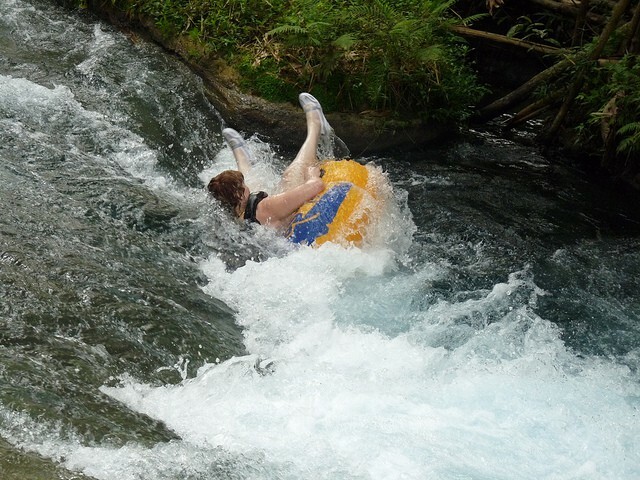 I had popped out of my tube in one “washing machine” spot and got pulled under. Mr. GFE rescued me and on we went. I had returned to my apartment hours later, grateful to be alive, but still looking somewhat like a drowned rat with wet stringy hair and wearing a damp cotton summer dress over my bathing suit. There was a knock on the door. I answered it to find a handsome stranger in a three-piece suit. He was holding a brown paper grocery bag. He introduced himself as the area Holly Farms sales rep and presented me with 5 pounds of chicken livers. You see … I’d written a letter to Holly Farms complaining that my recent container of chicken livers had been mostly chicken hearts, with very few chicken livers. 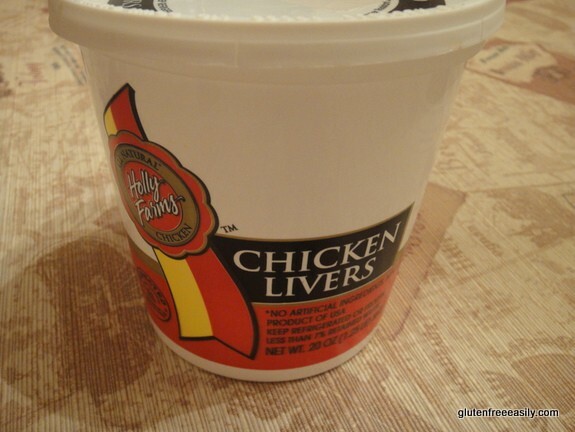 A few more letters had been exchanged because Holly Farms believed that the chicken livers I had purchased were not their brand, but the store brand. I corrected them showing them that the store had only placed its pricing label on the container. I guess Holly Farms wanted to keep a loyal customer happy, but that’s what I call customer service! I still lament the fact that I wasn’t more presentable. I mean that was back in my very youthful “goddess” days and Mr. GFE and I weren’t yet engaged or anything. So Mr. GFE dutifully picked up some blackberry wine on his way home the next day, and every other evening after that for a while, to be honest. After he’d arrive, I would sip a glass or two while we chatted and Son relaxed in the baby swing for a few minutes. (Son loved the baby swing and we loved that he loved it!) In the end, the blackberry wine did nothing for my diarrhea, but it greatly improved my disposition. It made me care a lot less about the diarrhea, and even helped me stop crying for a short while. And, it was a call to the surgeon who had removed my gall bladder 3 years earlier (another sign of my gluten issues; reference gluten-related issues once more here) that got me a medication that finally helped enough with “The Big D” to start me on my way to recovery. Well, temporarily anyway. Only going gluten free really solved “the big D” issues for good. Ironically, during my periods of diarrhea and nausea, which I now know were caused by gluten, I would eat only crackers or toast. 6. Before I went gluten free, I craved gluten. (This craving is not unusual for someone with gluten issues; read more from Dr. Ron Hoggan here.) One of my favorite breakfasts was syrup and toast. I have no idea if anyone else’s family ate this meal, but you mixed up King syrup and butter to make a dipping sauce, so to speak, and then you just dipped the toast in the syrup and ate until the sauce was gone. Of course, one always made too much sauce and had to keep toasting more bread. 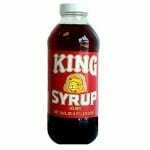 Incidentally, King Syrup is still around, but now contains high fructose corn syrup. However, I’m fairly certain it was always pretty much total sugar anyway. Again, I craved all bread products before going gluten free, especially cereal. I could live on cereal, one bowl after another. Now I rarely eat real bread products and don’t really miss them. I’ll enjoy them from time to time in the form of my homemade muffins, popovers, or even pre-made bread when a gluten-free friend makes bruschetta or brings a good ready-made gluten-free bread to our meeting for folks to enjoy. But, I still don’t go crazy about it. And, I’ve tried gluten-free cereal, but it does not do much for me and some brands labeled gluten free actually make me sick … but that’s a story for another day. 7. I’m still learning to like new foods and dishes. I really wasn’t exposed to a huge wide variety of foods growing up. That was more about my parents’ food preferences than anything like availability of foods/eating local. 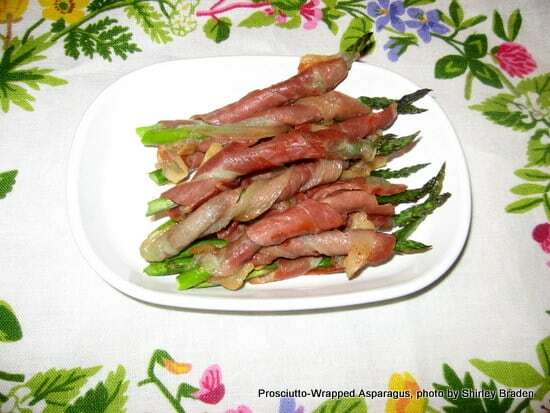 So it’s a delight to have found new loves over the last two decades: bacon-wrapped figs, asparagus in any form, broccoli (no sauce needed), avocados, mushrooms, and more. So, I’m looking forward to experiencing even more new foods and dishes in the future. Technically, I’m supposed to now bestow this award on seven other bloggers but I link to the folks and posts I feel are worthy of award just about every day, so I’ll consider that requirement satisfied. You are all beautiful to me! So, grab this idea (and badge) and come up with your list of seven things about yourself if you’d like. No strict rules or anything, but I do like learning more about my blogging buddies! OMG Shirley! We share so, so many things in common, well, except for the chicken livers part (really , watch out when I meet you at IFBC, I may never release you from my bear hug!). We have very similar food upbringings!! I ate out of a box and my mom did not want us in the kitchen making messes (which is why I am mindful to get my boys in the kitchen with me today). Red wine was my crutch after my celiac diagnosis and my other related conditions, like post postpartum “anxiety,” (that’s what the Dr. called it anyway, said it was different from depression but I beg to differ, I was definitely DEPRESSED!). I was also addicted to gluten and since being strict with my GF diet, I no longer crave it and I don’t each much bread, pasta, cereals, etc., anymore. I am also addicted to dairy (most specifically cheese and Greek yogurt), which I realize means I might do better without it. I will save that for after my iron problem is “fixed” though, I can only cut so many of my favorite foods out of my diet at a time and a low-iron diet is MUCH more difficult than a GF diet. I can’t believe I used to feel sorry for myself and complain about the GF diet being too hard, it really isn’t compared to other dietary restrictions! I will have to do this too, sounds like fun and I don’t think I have really ever shared much about me on my blog (well, other than my health problems, LOL!). You know so many serious symptoms and conditions get dismissed, like the postpartum issues. Part of that is the tendency to hide the truth though, as it’s not “cool” to say one is having some serious issues after you have a beautiful baby. Know what I mean? Motherhood is a tough gig from day one. One of the most rewarding, too, of course, but tough! I look forward to your list of 7! It is fun learning more about you. I adore reading your posts. It was interesting to discover how you see me. I appreciate the comments. I made my first ice cream and it made me think of you and no, I do not have a machine but what great ice cream, I made. It is in My Sweet and Savory and I am proud of myself. I can do it! Ooooh, I saw that ice cream you made sans an ice cream maker … bravo, my dear, bravo!! You should definitely be proud of yourself. Have you ever had your students make ice cream? You can do in in a can or ziploc bag. Look it up! Shirley – This was such a good read 🙂 Thank you for always sharing so much of yourself. I always love to hear about a Mom’s journey. I really feel lucky to know you and I so wish I was going to IFBC so I could meet you – one day! You are such a natural storyteller, Shirley. And a funny one, too. It was great getting to know more about you. Hi Wendy–Thank you for such a wonderful compliment! I truly appreciate it, Wendy. 🙂 Now if I could just learn to do all my editing in Word (with spell check capability) before I do the cut and paste so I don’t miss those late-night typos. 😉 I re-read a little while ago and had to fix several … egads. Wow, that was a good read! You touched every emotion for me. Love (LOVE) the washing machine photo. Who’s the photographer? It’s always nice to get a little peek inside the lives of such sweet friends whom we’ve never met (hard to believe, isn’t it?). And, you know, I like Mr. GFE a lot, too. He sounds like a really good guy. Hi Melissa–Aww, you always make a girl feel so good! Thank you! 🙂 As I shared on FB, the photographer is someone on Flickr who allows his photos to be used with a link back to him. The real situation was very close to that one, but even more of a washing machine if you can imagine. A bigger drop with lots more boulders around. I can still visualize it in my mind’s eye. 😉 We’ll soon be friends who have actually met in person! Thanks for the nice words for Mr. GFE, too. He truly is a good guy! Hey Shirley! Great to read about your life and you really made me laugh. You know when you were telling your story about rafting, I somehow read that to say that you had “popped out of your tube TOP”. Hey, I made your Easy “Crustless” Apple pie tonight along with your Microwave Meatloaf (except I made it in the oven, since the oven was on for the pie). My husband and son loved both and my son wanted to eat the whole pie. Thanks so much for your great stories and recipes and encouragement for gluten free folks!! 🙂 Cheers! Kay Guest Oh and by the way, I LOVED your post about beekeeping. I truly LOVE that you keep bees and am very interested in learning about it. Hi Kay–It’s so good to see you! I’ve been wondering where you’ve been! 😉 ROFL on the tube top … there was a very brief period of time where I wore a tube top. Even in my skinny days, my, uh, how do I say this? … well, my upper body was not well suited for tube tops. LOL Tubing, inner tubes now … not tube tops, always required a one-piece bathing suit at a minimum. Sometimes old shorts were needed, too … just to protect a girl from scraping on those rocks. Woohoo on meat loaf and crustless apple pie success!! You can never give me enough of that kind of feedback—thank you!!! 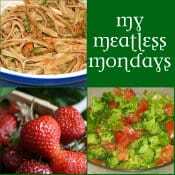 So glad you like my stories, recipes, and posts! Spread the bee love … you might become one of our future beekeepers. 🙂 Find a local beekeeping group and learn more. Finding a mentor and apprenticing is a good way to find out if it would be a good fit for you and your family before you invest money and time. Say only what is good and helpful to those you are talking to, and what will give them a blessing. Ephesians 4:29 This really makes me think of you! Hi again, Kay–You always make me chuckle—thanks! 🙂 Yep, you figured out ROFL correctly. I might have to just start leaving some acronyms for you just to keep you guessing … brain challenges, you know? Great news on Brian! Returning with a lemon cake, he’ll get a warm welcome back! 🙂 I’ve seen kill the gluten, but it’s been a while. Will have to visite them again, too. Honey, I Shrunk the Kids … yep, remember that with the huge (in proportion) insect flying around him. Locust tree, yes. They have magnificent blooms. Only when they are blooming do people usually notice them. I may have already mentioned they are my favorite firewood, too. They put out lots of BTUs and have great bark for kindling! Thanks Shirley! This was wonderful. I have a question about the gall bladder and gluten intolerance. If the gall bladder is removed, does that contribute to gluten intolerance? I ask since I had mine removed a few years ago and just discovered my intolerance earlier this year when I gave it up to see if it was related to my hypothyroid. Thanks, Shirley! I know you aren’t a medical professional, but in my experience in the last 2 years, I’ve realized that sometimes I can learn more from other people going through the same thing than I can from a doctor. 😀 I have definitely thought about getting the actual test done for Celiac after reading the first part of Danna Korn’s book and seeing even more of the symptoms. I have a follow up with my doctor next month and I plan on bringing it up. Hi Debi–I have to agree with your thoughts. Sometimes that’s definitely the case. Folks make fun of the web and while there is much inaccurate info “out here,” there’s also first-hand experience and support. I’m wondering how long you’ve been gluten free. Going gluten free can definitely negate the celiac testing. Good luck with your appt and celiac discussion with your doctor. Hopefully, he/she will see the logic. Sometimes convincing a doctor to test you is the first obstacle. :-(! A joy to read, Shirley! Your husband sounds so sweet and such a gentleman. 🙂 I loved reading how you two met. It’s not an everyday thing – it certainly isn’t on my parents’ regular grocery list, but I’ve used chicken livers before to make pate. I don’t remember my siblings being fond of the stuff but I think I liked it, or at least didn’t mind eating it. 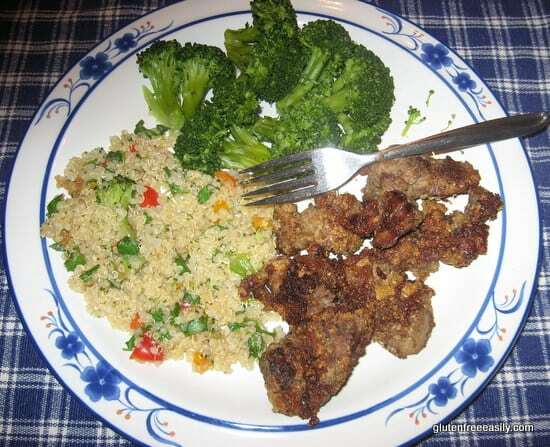 Chicken liver is a great source of iron, especially important on the SCD when vitamin and mineral supplements are generally not allowed because of all the added ingredients and preservatives/additives. Hi Zoe–Thanks so much, dear. 🙂 Yes, Mr. GFE is a gentleman … yes, ma’am; yes, sir; opening doors; and all that. 😉 Sometimes I take that for granted … this post reminded me of that. Oooh, chicken liver pate! Love it! Never made it though, but friends of mine have. We once had it on a canoe trip even. Divine to pull over to the shore and eat pate on crackers or veggies! Thanks for mentioning the iron factor, too. I tweaked my post a little to include that, because the fact is I used to crave liver all the time (I like beef liver, too), and still do occasionally. I never thought about the fact that supplements would not be allowed on SCD though. It certainly makes perfect sense. Thanks so much for sharing all that info; it will help many! What a sweet little love story, your Mr sounds just great. Thanks for all the information, recipes and hope that you share. I love your blog! Hi Suzanne–It looks like you are new to gfe–welcome! 🙂 Many, many thanks for your kind words … Mr. GFE is a pretty good guy. 😉 I do love sharing all that you mentioned here at gfe—hope, especially. What a fabulous post, my friend!! It’s wonderful to get to know you better. I had the same insatiable cravings, Shirley. I was never tested back then. It wouldn’t be worth it to eat the junk just to get tested now. I like gluten-free breads and baked goods but I don’t go ga-ga over them like I did with wheat. Hugs, my dear! I love not having those cravings any longer. Remember Seinfeld with all that cereal he always had? That could have been me, except the cereal would never last that long. Like you said, it’s nice to have a piece of bread now and then and not go crazy over it. I’m not sure that people who continue eating bread daily, even gf bread, get away from that totally. Carbs, sugar, etc. It’s great to learn more about you. Those were some fun stories to read. You got me thinking that maybe I should try chicken livers, but I dismissed that pretty quickly! I never craved wheat products and I don’t crave bread now, but sometimes when I bake something like French bread, it’s hard to stop eating it. And when I first discovered Udi’s bread, I went through the first loaf pretty quickly. Thanks for sharing your life with us and for linking to Gluten-Free Wednesdays. SHirley, what a wonderful way to share yourself with us. I loved each and every point! And on the note of the chicken livers – I, too, love them. However, the hubs does not, so they do not get made very often. Strangely enough, Conner (my 6 year old), likes them as well. My mom made them a lot when I was growing up (and I always remember chicken liver pate being a part of every holiday gathering). I also love your little tidbit about not being immediately taken with Mr GFE. That was the same case for me. I thought that Kurt was a little goofy for my taste and deemed him a better friend than boyfriend at the time. Not sure when it happened, but I fell hard for him unknowingly! Thank you for giving us this little window into your life. We must be on the same wavelength, because today I shared a story on my blog that had nothing to do with anything food, but everything to do with the story behind my family. I just needed a break and had a special photo to share. Hi Kim!–If we ever have that cooking get together we’ve dreamed about, we’ll definitely have to cook some chicken livers! I know what you mean Shirley. I had PPD as well after my daughter was born. I didn’t know I had celiac disease. I honestly thought I wouldn’t feel normal again. I think more needs to be done around testing for other issues that can actually cause symptoms like PPD, etc. Your blog and others help bring awareness though…. and that’s a huge step in the right direction. Great to learn more about you. Can’t wit to meet you in person in Seattle! Hi Carol–Great to see you here at gfe—thanks! I was able to resubscribe to your blog again after the subscription snafu a while back. So, expect to see me there again! Shirley, wouldn’t I know it that you would be the one to have a STORY for each of your 7 things! Love it. I am a huge chicken liver lover too! I also had huge gluten cravings before going gluten-free (same with dairy, same with sugar). Funny how our bodies work, eh? My doctor says we crave what we are allergic/intolerant to, and traditional doctors (and even Dr. Andrew Weil), disagree, but it’s true with me. And, I’m right there with you on the dairy and sugar, too, although the more/longer they are out of my system the less I want them … just like gluten. Thanks for taking the time to weigh in, Alta! I craved gluten too! I’m the same way though- I really don’t anymore. The only time I do is if I am in a bakery and smell something yummy or the familiar smell of pizza from childhood. I wonder why some GF items make us sick because some mess me up too! I warned a friend trying GF pizza with me that she might get gassy (for some reason GF pizza does that to me!). Thanks for sharing your 7 things! Hi Jessica–Nice to see you again! Thanks for taking the time to add your experiences. 🙂 Smell is our strongest sense i’ve read, so it makes sense that those smells bring back much more than the food and we miss it, even want it, because of the smell and all it invoked. A lot of gf items have starches, gums (and other binders), and additives our bodies are just not used to. I don’t do well with them and many don’t. Processed foods in general continue the inflammation process and more. I’m far better off using “regular” ingredients and eating real, whole foods. Glad you enjoyed my 7 things! And, it looks like you have started a blog since you posted before … will have to check it out! thanks for sharing with us this beautiful & fun post!! I totally relate about the cinnamon, sugar toast. But I can top you and Theresa. I would always be out of regular sugar, so I would use brown sugar with the cinnamon. Then I would promptly eat 4 slices. I would only stop out of guilt. I decided to try it with Udi’s bread the other night out of nostalgia. I ate one slice. It was ok, but didn’t feel like eating any more. I think you’re right about the chicken liver being anemia thing. My mom loves them and always has to get checked because her iron is always low. Mine has never been a problem, and I can’t stand chicken livers. Always a pleasure reading your posts, even if it is a little late. Hi Tia–Never apologize for being late … I’m just so glad you take the time to read and comment—thank you! And, special thanks for all your kind words, too. 🙂 A week is not long in falling for someone after a set up! Brown sugar with the cinnamon! Now why didn’t I think of that? LOL I don’t know if that tops the syrup, butter, and bread combo though. I’m sure I usually ate 4 slices for syrup and bread. We could easily go through bags of bread, and white bread at that. BTW, I’m the same with Udi’s. I think it’s good, but I’m not inclined to just eat and eat. Still, if I had a choice, I usually opt out from bread. I got my CeliacID results back – 31x with both the dreaded DQ2.5 AND the DQ2.2 – DQ2 Homozygous for me. Yay. Which makes a lot of sense with Mom having had both an ileostomy and a colostomy by 25. Five miscarriages and 3 live births between February 1960 and October 1964 (with me being the only surviving child – the other two were, well, “defective”). My undiagnosed rashes. My mother, her mother and HER mother having all lost all their teeth by 18. I’m still eating gluten for two reasons – one is that I hope to find a doctor who will give me the damn blood test AND I’m moving into a brand new house in 6-ish weeks. At that time, I will have brand new appliances and am springing for brand new toaster, etc. (since the old one died anyway). I figure I’ll take this short time to do a “farewell” tour of all my favorite things – my favorite pizza parlor, my favorite this, my favorite that. Since I’ve been sick for 46 years, I don’t think another month-ish will do that much more damage. But, damn – I grew up at my grandparents’ eating King syrup from a giant can that looked like motor oil came in it on pancakes. Leaden pancakes. Hubcaps. Don’t miss ’em. Gluten or not. Hey Dena–Wow, that’s pretty proof positive with your results and your family history. Although people who don’t know about all the celiac/non-celiac gluten issues would not make those connections. The teeth loss history in your maternal line is dramatic … all three … that’s something. I have to be honest and say I’ve never heard of dental issues that severe among multiple family members. Yes, you should get the blood test and proper celiac testing. Is there a support group in your area? Perhaps they could recommend a knowledgeable doctor for you. Just remember if you go through all that and test negative, still consider that you most likely have non-celiac gluten issues and should be gluten free. But, I’m sure you know all about that and will face that door when you come to it. Before I took the gluten sensitivity test, I did exactly the same thing you did … ate tons of pizza, lasagna, etc. While I don’t regret it, I will tell you that one doctor told me that it made my initial detox more difficult. I was dragging for months. But, everyone is different. Some folks feel better in the first few days or weeks, regardless of how much gluten they seem to eat. I guess it depends on how much one is eating before one goes gluten free. I do think that period gave me a grieving time, so that by the time my test results came in, I was ready to say no more gluten, done with that. Thanks so much for stopping back by to share your results. Best of luck on everything … keep us posted! I’m just getting to this now–and I love this post! Thanks for sharing so many great stories. Love how you and Mr. GFE met & that he saved you! I once read that long-married couples, when they think of each other, always imagine their partner as they were when they first met. . . ie, as you see the 22 year-old Mr. GFE! (I am the same way with the HH). And I don’t care if you worked in the kitchen–FBI is a fabulous and very exotic job!! My sister, who is 6 years younger, also worked at the FBI Academy. But, she worked “the line” … serving. In retrospect, I had the far better job … however much of a fluke it was. I think Efram Zimbalist , Jr. , from The F.B.I. television show, visited there when she was working. Remember him? Remember the series? Ahhhhh! Shirley you are so fun. Only you And Mr. GFE can make chicken livers into a real love story, lol! The more I get to know you the more I think how similar we are, husbands and all. I love that you are not afraid to be adventurous. Living on the wild side and revealing your love for chicken livers- now that’s brave! Perhaps you two would want to go camping here in the Canadian Rockies with our family some day…..
Now that’s a fabulous invitation to go camping with you guys! There’s only one thing that would deter us … something you have in the Canandian Rockies that we don’t have in our Blue Ridge Mountains and the Shenandoah Valley—GRIZZLIES! Can you ensure protection from the grizzlies? If so, we’d love to join you some time! You have to realize that the most we ever have in “our” mountains is an errant black bear. They are there, but rarely come out around people and then run off if you bang a pan or yell. A grizzly not so much! Hubby who had a friend from AB whose brother worked at the hotel at Lake Louise and encountered two grizzlies in one day in his walk through the woods to get home. Yikes! What a great post, Shirley! And here I thought I knew a lot about you!